Here are two pictures of the Neal Schon Signature Les Paul guitar. This guitar has some cool additions to the standard Les Paul design. The addition of a Floyd Rose vibrato, a built-in Wah circuit, and a Fernandes Sustainer in the neck picup location. This is one very custom Les Paul guitar! 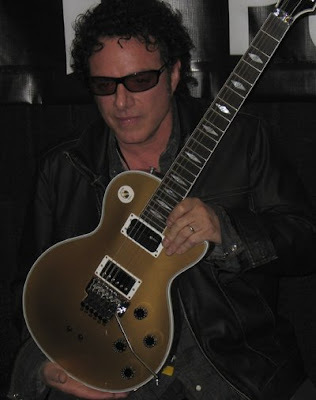 Neal Schon is the guitarist for rock group Journey and is one of my favourite players. When I was 12 years old I bought the Journey album Escape it was my first listen to what an amazing guitarist Neal is. He has written some of the most singable, memorable guitar solos and riffs in rock history. 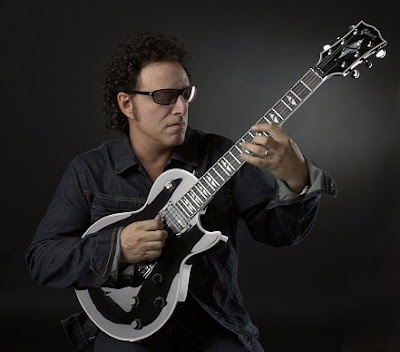 If you are a guitarist, I invite you check out the official web site for Neal Schon.